Looking for IKEA Credit Card? Nothing says affordable, stylish home furnishings like IKEA. The Swedish-based company was founded in 1943, and today operates more than 350 stores in 48 countries. The company focuses on eco-friendly, simple, cost-effective furniture, and has grown into a multi-billion-dollar business with nearly 150,000 employees and over 450 million visitors annually. IKEA offers different financing options to its consumers which include a credit card. While IKEA credit cards are available in different countries, IKEA USA stopped offering a credit card to its U.S. customers in 2011. However, consumers here can get an IKEA alternative credit card when they need help financing a big-ticket purchase or simply want to earn rewards. The IKEA Credit Card is no longer issued in the U.S.
Consumer credit cards like the cards above are accepted at IKEA U.S. stores and online at ikea.com. These cards may not give you access to IKEA perks but they have their own benefits. Some cards come with a 0% intro APR on purchases which is a good alternative to IKEA financing. Another good benefit a regular credit card can have, is a rewards program. You can choose to earn cash back, points or miles rewards. Also, many offer sign-up bonuses which you can get by meeting some requirements. It is possible to finance your IKEA purchases even if the furniture retailer no longer offers a credit card. There are lots of alternative cards so you should not have a problem finding one that works best for you. So does IKEA offer U.S. customers financing? IKEA special financing is offered in Canada and in European countries, but not in the U.S. While many European consumers take advantage of 12-months or even sometimes 48 months of interest-free financing, U.S. consumers can't take advantage of this. Special financing at IKEA was stopped several years ago. Today, U.S. shoppers can only take advantage of discounts, special sales events, and IKEA Family membership deals. However, the fact that IKEA's interest-free financing was stopped should not be an obstacle to furnishing your home. IKEA accepts major credit cards, which means you can apply for a 0% intro APR credit card to finance a big purchase at the store. Credit card rewards from an outside issuer plus IKEA membership discounts via IKEA's Family membership add up to a sweet deal. Almost all major banks and big credit card issuers offer credit cards with 0% introductory interest rates for a period of time, which vary from half a year to two years, so consumers can easily find a credit card with a zero interest period. The introductory period is a limited-time offer and it is important to know when it ends to make sure the balance will be paid off on time in order to save on interest payments. When you choose a credit card with 0% APR, you should remember that this zero interest is not always zero if you don't pay on time. Some credit cards offer deferred interest, which means you won't pay interest as long as you are making on-time payments and pay off the card balance by the end of the 0% introductory period. If you are late with a payment or fail to pay off the card balance in full on time, you will be charged interest back to the first day of the period. Deferred interest is common for store credit cards. The credit cards that are issued by major banks, like the cards above, don't generally come with deferred interest plans. Often, they come with 0% intro APRs and with benefits like no penalty fees and no interest rate increases for late payments. HAVE LIMITED OR BAD CREDIT? Why did IKEA stop accepting credit card applications? Now when I need to buy a kitchen, I would certainly buy it with their card. I had IKEA credit card but they discontinued their program and closed my card. I was OK with it but now I'm planning to make a big purchase at IKEA and wonder which credit card will be best for it? Does IKEA offer financing? Now that I'm mid-renovation, I would certainly find use for a card. It is important to understand the difference between store credit cards and regular credit cards when you are choosing a new credit card or planning to finance a big purchase. In some cases, it is better to have a store credit card, but sometimes a simple credit card that is not tied to any retailer turns out to be the best option in the long run. Store credit cards are good for someone who shops at one particular store regularly. Thus, it will be possible to get the most out of a store credit card. If you appear at that store just occasionally or want to finance one big purchase, a store card may not be the best choice. IKEA cards are no longer offered to the U.S. residents, but there is an IKEA Family membership program. If you want to finance a purchase, there are plenty of credit card options, including ones with no interest for a year or more. The IKEA Family membership is a great way to shop at the furniture giant and get IKEA rewards when you do not have an IKEA credit card or IKEA store card. Membership is free, and there's nothing for you to do but shop, get great discounts and special offers. You can sign up on their website and easily manage your account online. You can also opt to have all of the special offers e-mailed to you so you'll always be informed of the latest deals. When you sign up, you can choose to get the IKEA catalog mailed to you when it's updated, so you'll always be in the know on the newest IKEA products. You can also buy an IKEA gift card for family or friends. But don't forget to register for the IKEA Family membership. It's a no-brainer. If you need to finance new home furnishings or something that caught your eye in the latest catalog, credit card offers on this page make it easy to finance the purchase. Being an IKEA Family member means you will receive perks and benefits for your loyalty. Since there is no IKEA credit card for the U.S., the IKEA Family program is the easiest and cheapest way to save on IKEA purchases. The registration for the IKEA Family loyalty program is free and once you are a member, you get access to benefits below and a free coffee or hot tea anytime you shop at IKEA. Monthly Product Discounts. Every month, IKEA places a selection of products on sale with members-only prices just for IKEA Family members. 90-Day Price Protection. IKEA refunds the difference if a purchased product goes on sale at a lower price any time within 90 days after the purchase. Food Offers. Members get discounts on selected items in the in-store IKEA Restaurant or Swedish Food Shop. Extra Smaland Time. Members' children can play extra 30 minutes in SMALAND. A Chance to Winn a Gift Card. Every month, one IKEA Family member who wins a $100 IKEA gift card is randomly selected from each store. Create your password and select a security question and preferences and you are done. Once you register, you will be assigned a number (you will see a bar code with your number). IKEA doesn't mail out IKEA Family cards. You can simply use this number when shop at IKEA. If you prefer to have a physical card in your wallet or add a pass to your keychain, just visit a local IKEA store to print it at one of the IKEA Family kiosks. Visit any IKEA store and bring the printout. Scan the QR code at any of the in-store IKEA Family kiosks. The kiosk will print out your card. Note that the card number will be different than one shown on the printout. Both numbers will be associated with your IKEA account. Now, when you have your card, you should scan it each time you shop to enjoy benefits of IKEA Family program. Grab IKEA special offers as an IKEA Family member. There is no IKEA credit card for US but can I join their loyalty program? 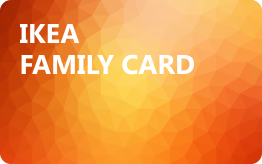 How to get an IKEA family card? I've heard about the benefits and free meals offered to the program members and I'd like to subscribe. For many consumers, a cash back credit card is optimal. Cash back rewards are easy to comprehend and calculate, and even easier to redeem. However, cash back rewards are not the only rewards you can earn. There are point rewards and miles rewards programs as well. Many people are familiar with reward miles, though points may be a different animal for some consumers. But once you understand how points work, you may prefer them. Good for those who are new to the world of rewards and want to get their first credit card with rewards. Cash back rewards are easy to earn and spend. Frequent travelers prefer this type of travel rewards because of additional earnings on travel purchases. Redemption options are also connected with travel. Point rewards are usually offered with co-branded credit cards. Often, specific shopping categories allow cardholders to earn additional points all the time or on a rotating basis. While IKEA credit cards are not offered to the U.S. consumers, anyone can buy or receive an IKEA Gift Card. The cards are available for purchase online at ikea-usa.com and in-stores at any participating IKEA store. The maximum cards value is $1,000 and the minimum is $5. 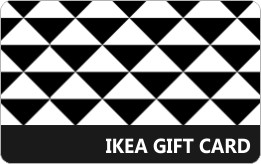 Gift cards are redeemable at IKEA US stores and online. You can purchase merchandise, services, food and beverages but you cannot redeem your IKEA gift card for cash or to purchase another card. IKEA gift cards do not expire. You can use them as long as there is money on the card. In case you want to know the IKEA gift card balance, you can call 1.888.888.IKEA (4532) or inquire it when visit a local IKEA store. When you need an IKEA gift card immediately, you can go to the IKEA website to buy an IKEA eGift card. The card can be personalized with a message and it will be delivered directly to the email requested the same day so they are great for last-minute gifts. IKEA eGift cards work like all gift cards: they can be redeemed at any IKEA location in the U.S.A. and online at www.ikea-usa.com. Where can I buy an IKEA gift card? My cousin is getting married, so I would like to help furnish their newly bought house. How to check IKEA gift card balance? I've already done some purchases, and I'm not sure how much money is left. Visiting an IKEA store is an event and can be lots of fun, but sometimes one simply does not have time or a nearby IKEA store to indulge. That is when IKEA online store comes in handy. You can browse the IKEA site and select items you like or you can look through the latest IKEA online catalogue to get inspiration or ideas. Make your shopping online even easier with the IKEA Store app. This app allows you to choose items and add them to a list so you could find them fast when you are at an IKEA store. Also, there are some useful services available online. IKEA offers online planning tools to design kitchen, wardrobe, storage, office or a child's room. If you do not know how to assemble your sofa or desk, look for assembly videos or downloadable instructions. Another service you may like is the IKEA Gift Registry. This service allows you to make lists of gifts you would like to receive and share the list with your friends and family for gift-giving season. Log in to your IKEA account and browse the site. Save the items you like to a list to buy them later or add them to a shopping cart to buy now. Go to shopping cart to review your purchase, add a coupon (if you have one) and specify the delivery address. Calculate delivery and go to check out to confirm the delivery address. Remember that you can edit your purchase (add or remove items) at any stage before you pay for it. If you have IKEA coupons, do not forget to apply them before you calculate the total. IKEA gift cards are also accepted as a method of payment when you shop online. Have a plan. Entering IKEA store without a plan and without a list of items you are going to buy may turn your trip into a disaster. Prepare a list of items you are going to buy, check availability, write article numbers, study IKEA Buying Guides and take measurements. Study the map. Once you are at an IKEA store, don't rush in the depths of the store right away. Take a look at the store map. The map is divided into two sections: Showroom and Marketplace. Study the map and note the shortcuts. When you know what you need and where to look for it, shortcuts will save you a ton of time. Drop the kids off. IKEA has a supervised play area for children called Smaland. The playroom is free and children can stay there for an hour, or for an hour and a half if you are an IKEA Family member. Get IKEA Family membership. The membership is free and gets you some perks and benefits. As a member, you can get discounts, free coffee or tea and other food deals. Take pics of price tags. These pieces of paper are extremely useful. They list colors, materials, sizes and other information. But the most important information they have is the aisle and bin number where you can collect the item from the warehouse. Disclaimer: This editorial content is not provided or commissioned by the credit card issuer(s). Opinions expressed here are the author's alone, not those of the credit card issuer(s), and have not been reviewed, approved or otherwise endorsed by the credit card issuer(s). Reasonable efforts are made to present accurate info, however all info is presented without warranty. Consult a card's issuing bank about the terms & conditions. All rates and fees, and other terms and conditions of the products mentioned in this article/post are actual as of the last update date but are subject to change. See the current products' Terms & Conditions on the issuing banks' websites. The IKEA Visa credit card is now available, offering 5% back in rewards on IKEA purchases. People with this card also earn 3% back when shopping for groceries, eating out and paying for utilities. All other purchases get 1% back.